Mutual Fund managers remained bullish on equity markets and purchased shares worth a staggering Rs 52,000 crore in the first seven months of the ongoing financial year.This is more than 40,722 crores already invested by them in the entire 2014-15 Financial Year. Between 2009-10 and 2013-14; Mutual Fund managers had cumulatively sold shares worth over Rs 68,000 crores. They had bought shares worth Rs 6,985 crores in 2008-09. They have made intensive buying especially in September and August, when the domestic market crashed due to rout in Chinese equities. During that time, overseas investors have pulled out from the Indian stock markets. The sell-off from overseas investors in the Indian equity markets is offsetted by Indian Mutual funds by taking on more risk. How Mutual funds are actually behaving? 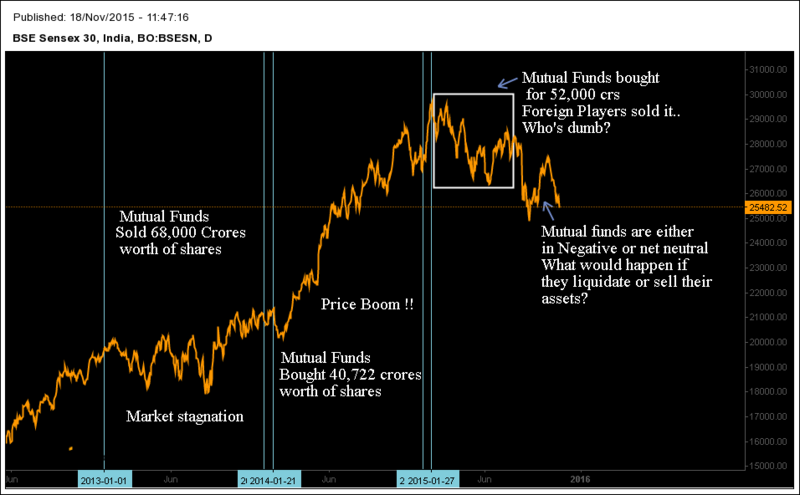 When you compare Price action of sensex and Mutual funds investment behavior, one thing becomes obvious. Mutual Funds are performing better in bull markets and tend to make many investing errors in uncertain periods and bear markets. From the perspective of a trader, This is nothing more than a Trend following strategy. “If Price rises buy and buy more, if price falls sell and sell more”. This is the Mantra. If we ever Witness a Minor Correction in Indian Stock Market, then entire Holdings will either be hedged or liquidated. In simple words, If a Minor selloff affects the Performance of Mutual funds then expect a Major fall in sensex. As International investors are walking away from Indian stocks, our domestic investors seem to take on more risk. This means securities are shifting from more experienced international investors to biased domestic investors. Paul Tudor Jones is right, when he said Price action moves first – Fundamentals come next”… It makes sense.